There’s a curious nexus of actions between the Pension Fund CEO, and the AFICS/NY leadership that leaves us more concerned than ever about how the Fund is being managed and how this may impact on the soundness of the Fund’s operations. We learned recently that the Office of Internal Oversight Services (OIOS) initiated an audit regarding the Fund’s substantial backlog and processing delays in payments to new retirees and survivors, and reportedly requested to meet with the AFICS/NY leadership in this regard. In closing, AFICS’ leadership says: “We feel that this is a matter that must be treated on the basis of facts and unassailable data alone and that the noise and commotion that have been stirred up is out of order. Lastly, let me say only that we could have had more fruitful consultations had we been privy to the scope of your study in advance. When it is ready we would appreciate being apprised as it may bring to mind further comment.” Of course, the efforts of OIOS to get the unassailable facts are opposed by the AFICS leadership. The petition to recall the CEO, initiated by CCISUA, contends that he ignored advice about measures to address the backlog crisis, and was distracted from his management functions by lobbying efforts to avoid an investigation into allegations of mismanagement made against him by some Fund staff; and to implement a revised Memorandum of Understanding that would privatize the Fund’s operations and delegate to him full authority from the Secretary-General over staff management on both sides of the Fund’s operations. Two petitions to the Secretary-General (one initiated by the staff union’s and federations’ and another by a group of retirees, and signed by a total of 16,000 Fund participants and beneficiaries) contended that these measures carried the risk of breaching the strict separation of the assets and liabilities sides of the Fund, a cornerstone of the system of checks and balances that has kept the Fund healthy when other funds have failed. As with the current email to OIOS, the AFICS/NY leadership has consistently dismissed concerns about the Fund’s management and steadfastly supported the CEO’s position on both the MOU and his explanations for the backlog. They have faithfully reposted his progress updates on the AFICS/NY website, as if they were his official spokespersons. An open letter dated 9 April 2016 (posted on the blog) from the former Chief of Entitlements of the Fund describes reports of the backlog as ‘selective and deceptive’ and calls on the UN Administration to establish an ad hoc tripartite investigation team, independent of the Pension Board and OIOS, to determine the real extent of the backlog and mismanagement in the Fund; and calls for hardship damages to be paid to those who have had to endure protracted delays in their pension payments. (A DM iSeek post dated 6 June 2016, states that the backlog has been 97 per cent eliminated as of 31 May 2016 and that the remaining 3 per cent is “in progress to be completed in June.” A blog post specifically on the backlog is upcoming). We must really ask who AFICS/NY represents when it seeks to undermine a serious OIOS audit with all these cavils. As retiree representatives, they should be supporting an audit that seeks to understand why this backlog has developed, how it can be quickly eliminated, and what has been the impact on staff who are in the process of retiring. The UN Ethics Office should be requested to carry out an investigation into the efforts of AFICS/NY leadership to at the very least weaken if not obstruct the OIOS audit. And it opens questions for AFICS members as to exactly whose agenda the leadership is pursuing. It is certainly not speaking for its members when it opposes any serious review of management practices in the Fund. We would like to thank [the group] (redacted) for including Warren Sach and me last week in your consultations related to your ad hoc audit of pension delays by the UNJSPF. On reflecting on our meeting, however, we remain puzzled as to the need for this exercise at this particular juncture and would hope that going forward it will be fully coordinated with the Audit Committee of the Pension Board as to scope, timing and content. For us, the timing alone seems problematic. One concern is that an audit at this particular time will require a gret deal of work and effort (e.g. interviews, data production, etc.) on the part of Pension Fund staff at the very moment when they need to be concentrating full time on operational priorities, and indeed may already be demoralized by the criticism coming from the staff unions and others. Another is that because you do not anticipate completion of your report until the end of the year, it would have little impact. Because of the foregoing and other concerns, we felt it necessary to provide you with our views in writing.Timely pension payments do not depend on the Pension Fund alone, as you well know. Before the Fund can even begin to calculate a pension, there are a number of essential preliminary steps that must be carried out in a timely manner by the future pensioner and the separating organization. Many retirees believe that the Fund is aware of their retirement date when in fact it is not and becomes informed only when the separation documents begin to arrive. Statistics on the time for organizations to complete dossiers show that this often takes several months, yet those months during which files remain incomplete are being counted by retirees waiting for their pensions in the gdelaysh. We are further disturbed by reference to a gbacklogh when it seems that there is no common understanding of the term. Terms such as delays and backlogs have been increasingly tossed around without being properly defined or communicated. Indeed, this may be as much the fault of the Pension Fund itself as it is of other voices. It is clear that some pensioners may be experiencing a wait of several months before receiving a pension. What we do not know is why, but we do know that the reasons in every case are different and individual and while some may be the Fundfs gfaulth, not all of them are. Further, it appears that there is no coordinated data on the numbers and reasons for the delays which is why much of it remains largely anecdotal. This has not prevented the staff unions from calling it mismanagement on the part of the UNJSPFfs CEO and petitioning the SG to terminate him. We feel that the noise from these sources has clouded the issue and served only to spread fear and anger. Early last summer, the Pension Fund informed staff nearing retirement that in August, 2015 it would be implementing a new IT system, IPAS, which would be run in tandem with the old one to ensure timely payment; it also advised them to set aside extra funds in the event the new system caused undue and unexpected delays. In fact, IPAS went off without a hitch for existing retirees who continued to receive their pensions in a timely manner and which is now processing payments at a much higher rate than in the past. For new retirees it appears that any delays in the early months of IPAS implementation were not solely the fault of IPAS. 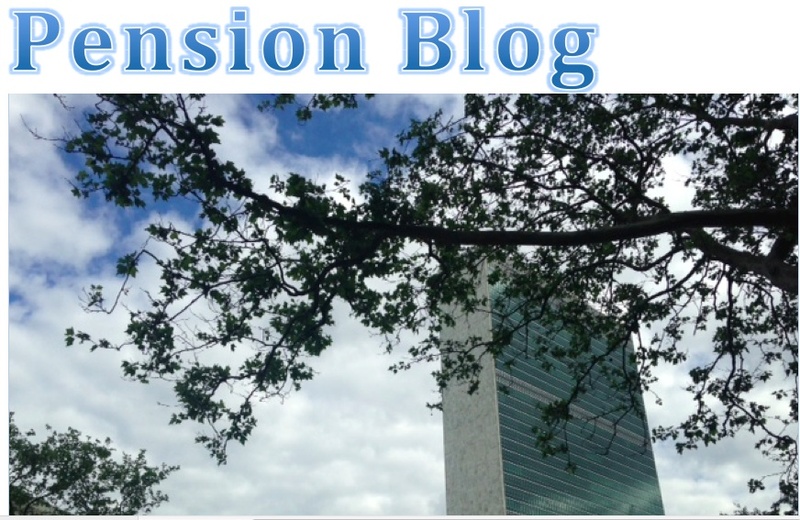 The UN Department of Management (DM) has been working closely with the Pension Fund for the past months to establish deadlines for payments, as DM is fully aware that its own role in providing the necessary separation documents is critical. In his address to the AFICS/NY Annual Assembly on 19 May, the Secretary-General confirmed that he expected all pending cases to be dealt with by the end of this month. AFICS/NY attaches the greatest importance to the timely payment of pensions. That is why we have been in close contact with the Pension Fund management since the current problems and criticism first began to appear last year. We have not refrained from candid and open criticism where it is due, but have strongly rejected any false assertions whatever the source. We feel that this is a matter that must be treated on the basis of facts and unassailable data alone and that the noise and commotion that have been stirred up is out of order. Lastly, let me say only that we could have had more fruitful consultations had we been privy to the scope of your study in advance. When it is ready we would appreciate being apprised as it may bring to mind further comment. Please be assured that we remain available for future discussion.